A recent study was published in (www.medicalnewstoday.com) regarding a breakthrough in Alzheimer’s research. The College of Food Science and Engineering in Yangling, China, found that it is possible for chicoric acid to help maintain memory in patients with Alzheimer’s and/or similar related neurodegenerative symptoms. Their findings were published in the FASEB Journal (Food and Science Engineering Book). Several tests were performed with mice, known to have Alzheimer’s disorders and when given chicoric acid derived from chicory, the mice displayed more cognizant characteristics and better memory. The doctors behind the research feel it may help maintain memory in patients with Alzheimer’s or similar forms of dementia. Further studies are under way. The researchers say that further clinical testing is still needed. A prominent doctor in California suggested sprinkling chicory on food at meals three times a day, to enable the chicory to enhance memory for individuals suffering from memory loss due to Dementia related symptoms. 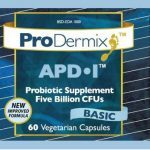 But, one capsule of PeoDermix has the chicory derivative equivalent to many jars of chicory. INULIN is a derivative of the Chicory Root and should perform similarly to aid in maintaining memory. 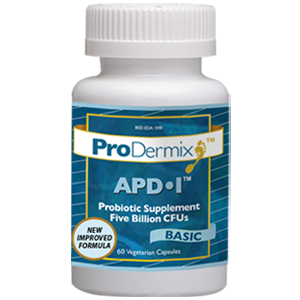 APD 1 (5 billion CFU’s) contains a very high dose of inulin. On the bottle it states “in a base of inulin derived from chicory root”. The content is several hundred mg of inulin. Jon Barron Research (jonbarron.org) has found that medicinally, inulin has been reported to help address the following symptoms: acne, cellulite, constipation, diabetes, eczema, gallstones, gout, jaundice, liver irregularities, rheumatism and urinary ailments. Note: Dementia and Alzheimers are considered basically the same.